Tropical fruits provide some of the best nutrition and disease-fighting power of any foods on Earth, but if you live in the Midwestern part of the United States or other less-than-tropical areas, you probably have only eaten them through shipments from out-of-state. But there’s at least one lesser known tropical-style fruit that may be growing in your backyard right now, even if you live in a traditionally colder climate. The Paw Paw fruit is not very well known among the mainstream, but people have enjoyed it, and the myriad health benefits it provides, for many decades. Also called the “Hoosier banana (when found in Indiana), “Michigan banana (same concept),” “poor man’s banana” or many other names, the Paw Paw has a smooth, custard-like texture and a subtle but excellent strawberry-banana type flavor according to many who’ve tried it. Some get it in its fruit form while others get it in a Paw Paw supplement form. Either way, it has been said to provide incredible health benefits. The Paw Paw fruit is not only the largest fruit native to North America, it also brings with it a wide range of unbelievable health benefits. The findings were published in the journal Cancer Letters and the Journal of Medicinal Chemistry. The Paw Paw Fruit (and Bark) offers incredible health benefits. Click the picture for more info. 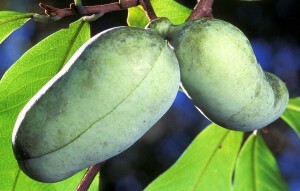 Paw Paw trees and fruits can be found growing in otherwise humble Midwestern forests, and are most often found in shady areas on trees near riverbanks. They typically ripen in late August and stay ripe all the way through October, however. Some farmers have taken to growing them experimentally or as a unique addition to their own personal gardens and orchards. If you don’t have access to Paw Paw fruits or live outside of the Midwest, you also have the option of buying Paw Paw in supplement form to enjoy its many amazing benefits, but be careful as it is strong natural medicine that some people have experienced side effects with. Therefore you should consult your doctor first.